There are thousands of self-help books in the management section of your local bookstore, covering a bewildering spectrum of ideas about how to bring out the best in people. Few of them are helpful, beyond trite statements about human behavior, and even fewer of them are based on more than a modicum of research. 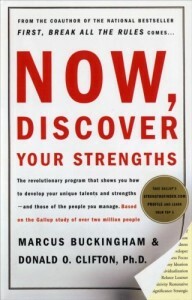 Now, Discover Your Strengths is an excellent book on both counts. The Gallup organization has studied excellence in many fields for over thirty years. This book summarizes some of that research from the perspective of identifying and bolstering people’s talents. The writers worked hard to make the book clear, precise, and readable. The book never sacrifices clarity, even when faced with complex ideas. I had to read the book twice to make sure that the straightforward writing wasn’t masking conceptual problems. It wasn’t. The writers lay out the main idea right away; they write that “to excel in your chosen field and to find lasting satisfaction in doing so, you will need to…become an expert at finding and describing and applying and practicing and refining your strengths.” They go on to describe precisely what they mean by “strengths,” then they give you a tool to discover your own strengths by taking an on-line test. The outstanding thing about Now, Discover Your Strengths is the foundation of research that supports it. The Gallup folks are serious about their research. The claims in this book are based on reliable studies of almost 2 million employees. If you have any doubts about their research methods, the writers supply a technical report on the StrengthsFinder tool in an appendix. I almost wet my pants with glee, reading about interrater reliability, modern test theory, and “big five” personality factors. All of this is safely ignored in favor of the practical suggestion in the main sections of the book, but it makes a skeptic like me confident in recommending this book to everyone on my team. It comes with a free test…a similar tool would cost hundreds of dollars if you bought it from a career counselor or management consultant. It is carefully written and eminently practical. Now, go buy yourself a copy, take the test, and start a strengths revolution at your own workplace.